Nothing says “fresh” quite like a beautiful spread of raw vegetables paired with a flavorful hummus. 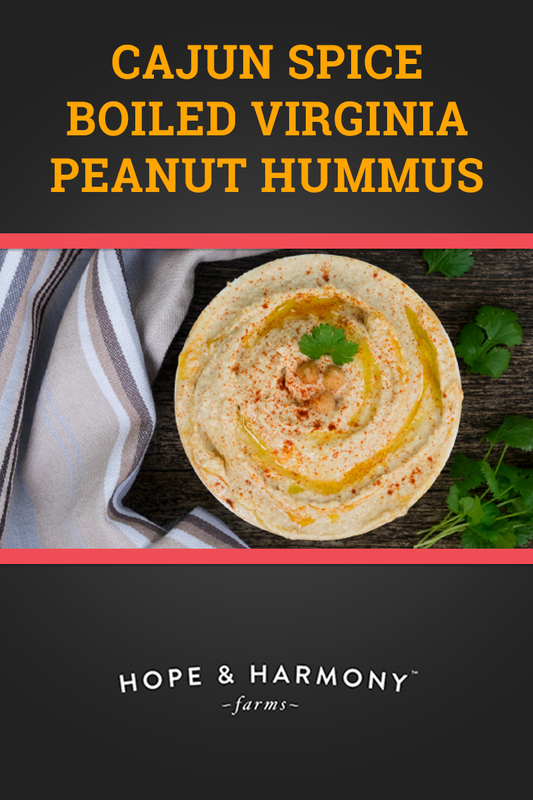 With hummus, the possibilities are endless: use hummus as a tasty dip to accompany fresh veggies, or as a delectable spread for warm, seeded bread. A tasty addition to a pita wrap or fresh bagel, our flavorful twist on traditional hummus is the perfect sandwich spread, or a wholesome addition to a fresh, summer salad. The perfect blend of cajun seasoning and boiled peanuts will dazzle the whole family’s taste buds; even the kiddos will come back for seconds. Combine ingredients in bowl and set aside. Put the vinegar and water in a big pot and bring to a boil. Add the Cajun seasoning. Add peanuts. Find a plate that is just smaller than the diameter of your pot (Make sure the peanuts are covered with water). Place the plate on top of the peanuts to weigh them down a bit. Lower heat to a simmer and cook for about 6 1/2 hours, or until peanuts are very tender (add water as needed to keep peanuts submerged). Drain and cool on a pan in the refrigerator. Store in refrigerator in a sealed container for up to 5-7 days. Shell one cup of them for hummus and save the rest to prepare additional hummus or keep as a snack. Hint: you can use peanuts that are already shelled to boil or use boiled peanuts from a can. If using can boiled peanuts add Cajun seasoning directly into your hummus for added flavor and an extra kick. Combine the boiled peanuts, the tahini, garlic, lemon juice, in a food processor and turn on low heat. With the motor running slowly add the green peanut oil to emulsify. Then add the water to thin and blend until the spread is the consistency of a spreadable hummus. Season to taste with salt, if needed. Remember, boiled peanuts are salty already. To be served with fresh bread, crackers, chips, pita bread, or veggies. It’s never been easier to get the children to eat their veggies! Happy Snacking! *Royal Oak Peanuts states these peanuts in these containers are raw and have been inspected by the USDA, but still may contain bacteria, and if not cooked properly could cause illness. For your protection, any peanuts labeled as raw MUST be cooked prior to consumption.